Quilter’s Patch – Block of the Month – April blocks are finished! This month I asked my special needs daughter, Mimi, to model the finished Day Lilly block. Both April blocks for the Quilter’s Patch Block-of-the-Month are done! The Tulip and Day Lilly blocks were easier than last month. I didn’t have to take out my seam ripper one time this month. However, I started to sweat looking ahead to May’s blocks. The Dahlia block has lots of hexagons … and I’ve never gone near a hexagon in my life! The Honey Suckle block doesn’t look any easier … full of 60 degree triangles and bias edges. Looks like I will have to step-up my game! 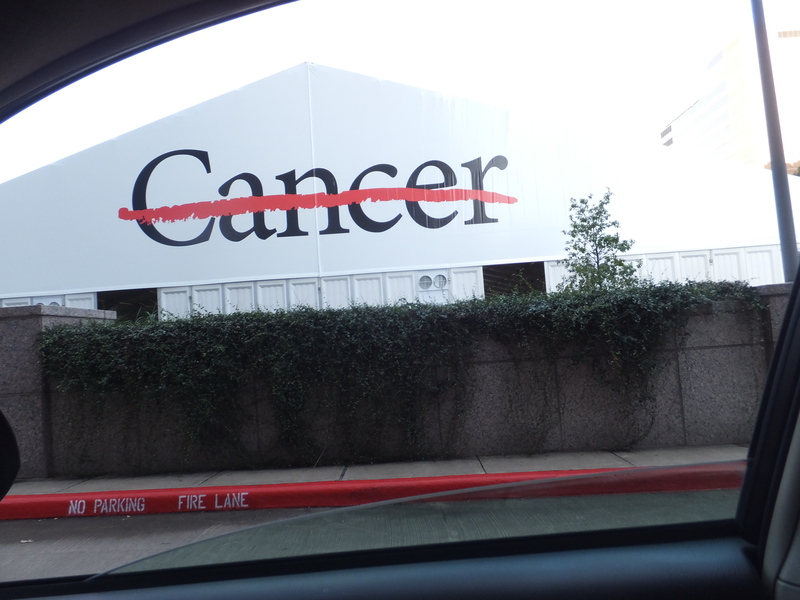 A cancer journey – Inlyta does not like Rick … and MDA’s Kidney Cancer Conference! An update on Rick is in order. I know … it has been two months since you’ve heard a peep out of me. I’ve learned that some things just need time to evolve. In some respects, I miss the kidney cancer immunotherapy trial. It was predictable. We went in every two weeks for bloodwork, visit with oncology and nine times out of 10 … upstairs to the 8th floor for an infusion. Then every three months MRI and CT scans. Last year was hard work but there was a rhythm to it … it felt kinda like a slow waltz that sped up as Rick got better. Just imagine Rick and I in the middle of the dance floor with all these MDA people … everyone with their dance shoes on … swirling around us and smiling. Back to reality! So Rick started taking Inlyta on Valentine’s day. The drug was approved in 2012. The purpose is to block blood vessel growth which feed cancer tumors. He started with 5 mg twice a day. The drug has lots of side effects and the poor guy had most of the ones listed on the MDA Patient Education handout. Rick lasted 24 days before having to come off the drug. Then a two-week medication break … which was heavenly … I got my husband back. He then started on 3 mg of Inlyta twice a day. The first week wasn’t bad. I kinda thought this was going to be our long-term cancer drug. Then the bottom fell out. On day 11, in early April, Rick was off the lower dosage Inlyta. Dr. Campbell ordered scans last week on Holy Thursday. Yep … we have been living our Lent again this year! We see him this Friday for results and a path forward. If the scans look as good as last time, there is talk of a medication “holiday” which I think could be way longer than two weeks. This is what I pray for Rick … hourly. The last time we saw Dr. Campbell he explained that Rick was kinda unusual in the way his treatment unfolded after being diagnosed last year. Normally, a patient comes to MDA in much better shape … not in a wheelchair. They often start with something like Inlyta, called a frontline drug, and then maybe graduate to surgery, an immunotherapy clinical trial, or other treatment. Rick was so bad over a year ago there wasn’t time for a frontline drug. He went straight to the clinical trial … with stunning results. Dr. Campbell believes, and so do we, the immunotherapy drugs are still working. One indication is lots and lots of itching. Go figure! Did I mention I attended MDA’s Kidney Conference this past Saturday? I was so impressed with the MDA staff presenting! It is the 10th year MDA has put it on for patients, caregivers and the medical community. They always videotape it. When I get the link, I promise to share! My friend, Hildy, a kidney cancer survivor, told me about the conference and we went together. She has been going for a bunch of years. I love Hildy. She is brave, open and a lover of life! Hildy is one of the first people I leaned on at the beginning of our cancer journey. In a peanut shell … here is what I learned about kidney cancer. Note that some of what I learned applies to all cancers! I learned knowledge is power. If you are a caregiver … become knowledgeable. I hold each kernel of knowledge to my chest and hug it deeply. Did you know in the United States, 63,000 are diagnosed with kidney cancer each year? I learned kidney cancer does not respond to radiation or chemo and 75% of kidney cancer is clear cell. That is what Rick has. I learned lots of kidney cancer patients ask for PET scans. Don’t. They are not a reliable test for kidney cancer. I learned each patient is very individual as far as treatment. I learned that 10 years ago most people with stage 3 or 4 kidney cancer lived one year and there was little to offer patients with kidney cancer. Now there are 12 to 13 new treatments and more promising clinical trials are popping up. I learned about frontline drugs, immunotherapy clinical trials, and mTor inhibitors which slow down cancer cell growth. I sound like a cancer nerd don’t I? I learned in the next 10 years there will be more personalized treatments available. Right now about 25% of patients are responding to immunotherapy clinical trials and they don’t know why yet. My rock star husband is a success story! MDA wants to know how to help the 75% that are not. Also, the 25% of kidney cancers that are not clear cell need to get their far share of understanding and treatments. I learned that the results of several clinical trials will be published soon. There are many more clinical trials and emerging therapies on the horizon. I learned there are no predictive markers for kidney cancer. I learned that 2013 was a breakthrough year for kidney cancer immunotherapy. Did you know that immunotherapy can kill cancer cells? It is adaptable. It kills specifically cancer cells and it has memory. I think one of the most important things I learned … and this can be applied to all cancers … is DO NOT GET TIRED OF FOLLOW-UP! If your doctor says you need scans every three months, six months, or once a year, get them! Be vigilant!